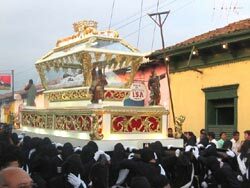 Izalco belongs to the department of Sonsonate. 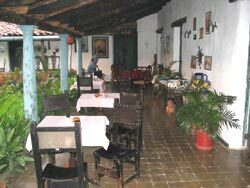 Izalco is located on the road CA 8 from San Salvador to Sonsonate, at a distance of 58 km. The capital of the municipality of Izalco is located at 430 m ASL on the southwest skirts of the volcano Izalco. According to the monk Juan de Torquemada "Tecpan Izalco" was founded in 1054 by Topiltzin-Acxil. Since the colony, Izalco was part of the municipality of Sonsonate. 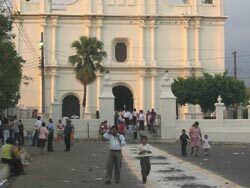 In 1770 it was divided into the churches of Asuncion Izalco and Dolores Izalco, where the divisions between Indians and Spaniards was remarkable; the latter ones were forbidden to interact with the people from conquered towns. Spaniards had to live near the cocoa plantations since they knew Indians were not going to cultivate it unless forced to, because they knew they were not going to make any profit out of it. This situation caused many Spaniards to move from Sonsonate to Izalco, which later led to the mestizoes (union between Spaniards and Indians). After the Independence was gained from Spain, Izalco became part of the state of Guatemala. Among the many famous people born here we can recall: General Francisco Malespin (Founder of the National University), Writers: Calixto Velado, Oscar Escobar Velado, etc. The nahuatl word "Itzalco" means "place of the houses of obsidian". 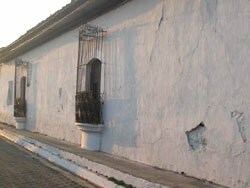 Izalco was one of the towns defeated during the 1932 rebellion, just like the town of Juayua. Some people say more than 20,000 people were killed including Feliciano Ama - indigenous leader/cacique. Many people believe the 1932 rebellion is the cause why not many people in El Salvador speak the dialect "Nahuatl" or wear traditional indigenous clothes (chal, refajo, caites); since people were afraid of being recognized as participants of the rebellion.